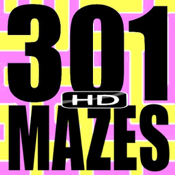 301 Atomic Mazes HD - For the iPad! This app is a huge collection of mazes! We packed 301 awesome mazes into this app! Includes easy, medium, hard, unique and different, kids and adult mazes... there’s something for everyone! Plus, there are no in-app purchases... everything's included! Simply tap a color from the Color Bar and get started! Finger paint your way through each maze! Select from a range of paintbrush shapes and sizes that will suit any maze. When you’re done, tap Save to share your accomplishment with the world or to set the maze as your wallpaper! + No in-app purchases... everything's included! + Includes easy, medium, hard, unique, and different mazes that are suitable for all ages! + Use the Save feature to save any maze to your device’s Photo Album. Email or text it to anyone for free, or even set it as your wallpaper! + Swipe the Color Bar for a large assortment of paintbrush colors! + Change the size and shape of your paintbrush for extra fun! + Tap Undo to fix any mistake! + Watch for FREE updates for more mazes!